I don’t find gluten free pastry the easiest thing to work with! Give me challenge re gluten free bread or pizza dough and not a problem. I was never any good with normal pastry before being diagnosed with Coeliac disease. So it was with some trepidation that I was given the challenge to try out Simply Wize gluten free puff pastry sheets. You can buy the sheets from Woolworths for about $9 for a pack of 4 sheets. I followed the recipe below from Simply Wize but even after leaving the pastry out to defrost wrapped in plastic I still could not manage to roll out the pastry sheet to be 26cm square. I am not going to put a photo up as they don’t look the best, not puffy and golden and filling spilled out a bit. But will say they still tasted delicious – pastry crispy on the outside and soft (but not puffy) on inside and the filling tasted delicious – very nice warm but could take them to picnic lunch cold. Feel free if have any tips on what went wrong for me and why don’t look like the picture. 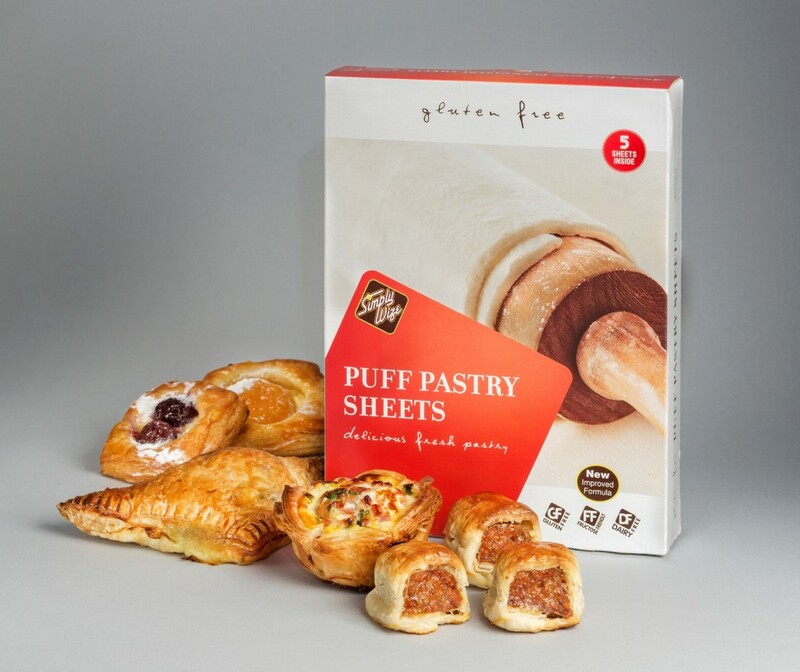 Separate Simply Wize Puff Pastry sheets while frozen and thaw for 40 minutes in a plastic bag at room temperature. Return unused sheets to freezer. Preheat oven to 210°C, and line 2 baking trays with baking paper. Sauté sliced onion and chopped garlic in frying pan. Add spinach until tender. Whisk 1 egg in bowl and stir in spinach, feta, sautéed onion and garlic, with salt and pepper to taste. Dust bench with gluten free flour and roll out Simply Wize Puff Pastry sheets to 26 x 26 cm then cut into 4 equal squares. Divide the filling among the 8 pastry squares and brush edges with egg wash (1 egg and 1 table spoon of water beaten). Fold in half diagonally to enclose filling and pinch edges to seal. Place the turnovers on prepared tray and brush with egg. Bake for 20 minutes or until puffed and golden.